The global specialty zeolites market is characterized by the presence of a large number of players, notes a research report by Transparency Market Research. In 2015, the market was dominated by BASE SE, Tosoh Corporation, Arkema Group, and W.R. Grace & Co. that collectively held 34.7% of the overall market. Overall, the reach of players is wide and diverse with the presence of large number of enterprises in all sizes. The top players are largely engaged in applications of technological innovations in a bid to reduce processing cost and to introduce premium quality products at a commercial level. The global specialty zeolites market is highly competitive among key players. The majority of the players operate on goodwill and long-term agreements for sustainable business. Despite the price volatility of raw materials, new players can enter into the specialty zeolites market due to easy availability of raw materials. Nevertheless, the market is expected to face challenges from substitutes such as silica gel and activated carbon. The global specialty zeolites market stood at US$40.1 mn in 2015 and is expected to reach US$53.4 mn by 2024 at a CAGR of 3.2% between 2016 and 2024. In terms of geography, the global specialty zeolites market is analyzed with respect to the regional segments of North America, Asia Pacific, Europe, Latin America, and the Middle East and Africa. In 2015, Europe held the leading share in the global market trailed by Asia Pacific and North America. Over the report’s forecast period, Asia Pacific is expected to contribute substantially to the growth of the global market due to rising commercial construction and infrastructural development in countries such as China, India, Singapore, Malaysia, and Thailand. China is investing heavily in infrastructural development predominantly in the construction of commercial institutions and healthcare centers. India is expected to display substantial increase in construction activities that will lead to increased demand for specialty zeolites, which is likely to surpass the demand from China. 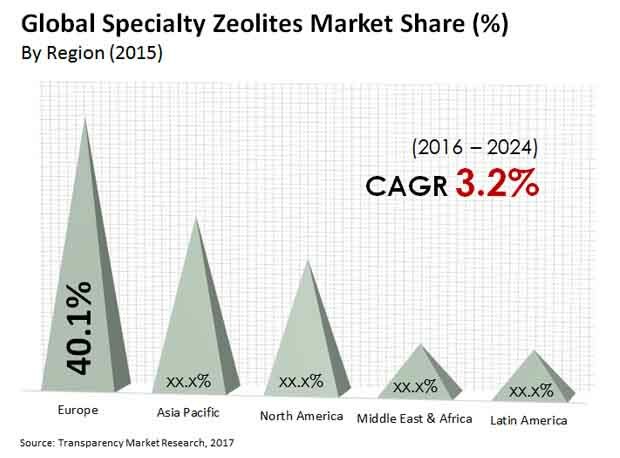 The Middle East and Africa specialty zeolites market is expected to display moderate growth due to the preference for substitute adsorption products over specialty zeolites. Paints and coatings stood as the leading revenue contributor to the global market in 2015, trailed by construction materials and plastics. The paints and coatings industry is displaying a rise in the use of specialty zeolites due to stringent government regulations in place to eliminate volatile organic compounds (VOCs) in paints and coatings. They are also used to make construction materials that satisfy the requirement of energy-efficient building materials and are decorative as well. Specialty zeolites are also used in the construction sector for the preparation of high performing lightweight concrete. The surging construction activities across the world is currently the major factor driving the global specialty zeolites market. In particular, in Asia Pacific and Latin America, infrastructural development as a consequence of economic growth is displaying a significant demand for specialty construction materials. The growing demand for specialty zeolites from the paints and coatings industry, which is also driven by the construction industry is favoring the growth of the specialty zeolites market. However, high cost of specialty zeolites is one of the key factors hindering the market’s growth. The high level of complexity involved in the manufacture of specialty zeolites make them much more expensive than other forms of zeolites. The availability of substitutes such as activated carbon and silica gel are also challenging the market’s growth. Both substitutes are extensively being used in paints and coatings, which is resulting into diminished demand for specialty zeolites.